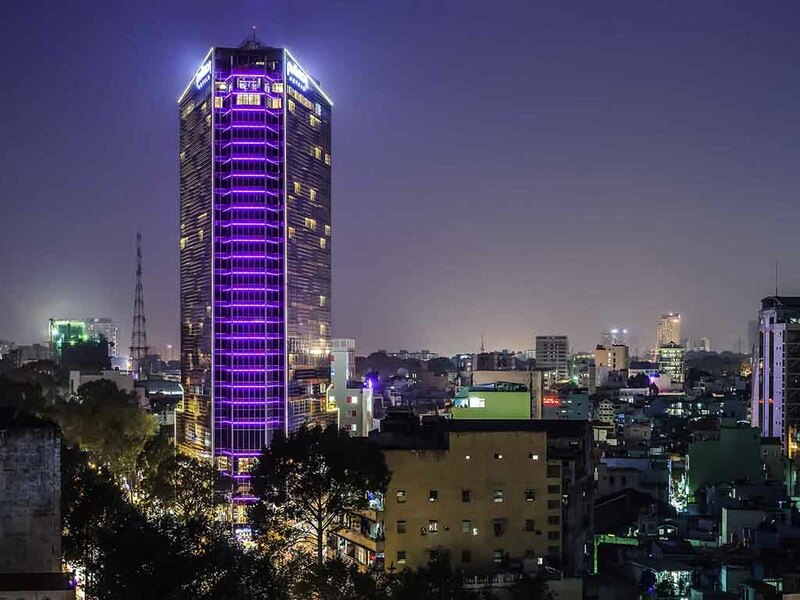 The hotel is located just minutes away from the major business and commercial areas as well as the city's main attractions such as Ben Thanh Market, Notre Dame Cathedral, Opera House and Saigon River. All rooms come with the comfortable Pullman signature bed, a 40inch LED IPTV that can integrate with guests' devices, rain shower, tea & coffee amenities, free WiFi, 24-hour room service and vibrant views of the city. Mad Cow is Saigon's outlet to meet mingle and taste amazing grilled Steaks or Seafood and enjoy great selections of madly priced wines! Mad Cow is the new daring answer to a casual yet cool experience that is far from a normal restaurant. Located on ground floor, the bar extends from indoors to outdoors. It is the perfect place to entertain friends and business partners or simply relax and watch the world go by. Cool refreshments, cocktails and snacks are available all day at the Pool Bar. We've come to rely on the Pullman as our second home in HCMC as we visit regularly, and we are always gratified to find a consistent high level of professionalism and hospitality from the staff, as well as exceptional facilities and amenities. Also, the location is ideal -- within walking distance of Ben Tahn market and Bui Vien street and easy Grab or taxi ride to the rest of District 1. From the breakfast buffet (wide range of options) and the gym (clean, new equipment) to the well designed rooms (i'd recommend high-floor corner rooms that offer two sides of floor to ceiling windows over the city) to the Executive Lounge with its generous nosh-ables and libations. Big thank you to Lounge manager Linh and and staff, particularly Ngan. Well done! Facilities,location and food and beverage staff and front desk were really great. Looking forward to our 3rd visit to one of the best hotels in Asia. I enjoyed my stay and found the room comfortable. Staff were helpful and the technical support for the event in the ballroom was good. From the moment I was greeted at the airport to the moment I checked out the staff of the Pullman were extremely attentive to my needs. Very helpful with directions and recommendations of places to see. World-class service. Great ambience. Happy staff. Awesome food. Perfect location. Very well positioned hotel with awesome service and food choices. Kids loved the room service with hospitality at best. At arms distance pretty much all amenities ...Love to come back again. Thanks for your friendly and correct service during my stay! Good quality. check-in & check-out processes, breakfast, all over of the room were worth to paying the lodging fees. I always pick the Pullman Saigon as I know what to expect... Unwaveringly exceptional service at every level. A genuine sense of &quot;welcome home&quot; from staff who are not just going through the motions of service but who obviously enjoy and appreciate providing superb guest experience. &quot;Welcome back&quot; really means just that... and is extended with warmth and smiles. Small issue with the top floor restaurant this time round but the issue was rapidly taken care of with sincerity and to my total satisfaction. Well done again Pullman Saigon Square... See you next time for sure!! Stayed one night due to flight connection, excellent stay and service from start to finish. Marsh Singapore's 2019 Company Trip at Ho Chi Minh City was a Great Success! Of all the company events we have organized, Pullman Saigon Centre demonstrated the BEST services and eagerness to work with us. Kudos to Kendra, Vu, Andy, Khanh, Minh and team. Keep up the good work! I love the buffet breakfast options. Pool and gym is good. It would be nice if the gym had some yoga mats and foam rollers. Upon arrival and through checkout, the staff has helpful and accommodating. The hotel itself was clean and comfortable.